MK Moshe Feiglin (Likud) slammed the latest rioting incident on the Temple Mount Wednesday, calling Israel's control over Judaism's holiest site a "failure." "Over the last five days, the Temple Mount has not been occupied by the Jordanian army, but by a division of Hamas," Feiglin said. "The failure of the police to control events the Temple Mount is, in fact, the failure of political leadership in keeping the heart of Jerusalem [intact]." "Continuing to drag our feet [on the issue] will result in history remembering the Israeli government and its leader as having abandoned the Temple Mount to the Hamas regime," he added. According to Feiglin, placing a special unit of Israeli police at the site to specifically prevent riots is the "response is required to maintain our sovereignty over the Temple Mount and Land of Israel as a whole." Dozens of Palestinian Arab terrorists rioted against police at the Temple Mount on Wednesday, after Jews were allowed to visit Judaism's holiest site in light of the Passover holiday. On Monday, just hours before Passover began, Hamas Islamists rioted on the Mount, waving Hamas flags and "not allowing Jews and tourists into the Mount," according to activists. “Hundreds of Jews who came to the Temple Mount for Pesach were astonished to find a police representative standing at the entrance gate and announcing that the Mount had been closed off to Jews after Hamas had taken over the Mount and threatened violence against any Jews who enter,” the Temple organizations reported in a news communique Monday. On Sunday, over 20 Hamas men stayed overnight on the compound, sparking calls for the police commissioner to resign after it was revealed that police forces had allowed them to do so. 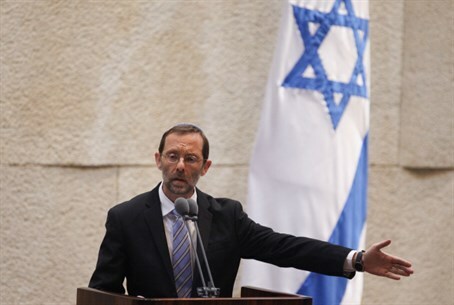 Feiglin's words echo statements by Temple Institute International Director Rabbi Chaim Richman, who told Arutz Sheva that recent events show Israel's policies regarding the Mount are a "national catastrophe." "In the middle of Jerusalem there is a city-state with diplomatic immunity where the enemy flag is unfurled and where plans are being made to attack Jews... that is absolutely unspeakable," Richman said Wednesday.